The announcement made by the Finance Minister (FM) of no tax liability for income upto Rs. 5 lakhs created euphoria initially. This most beneficial proposal in the budget evinced the maximum interest and as well as also created maximum amount of confusion in the minds of taxpayers till the dust settled down on the proposal and people realised that this bonanza is available only for the taxpayers whose income does not exceed Rs. 5 lakhs only and not for all the tax payers. Let us discuss how the finance minister proposes to do this. From the later discussions in the media it has drawn on the tax payers that the FM does not propose to increase the basic limit from existing Rs. 2.50 lakhs to Rs. 5 lakhs for every individual tax payer but is proposing to ensure exemption of income upto Rs. 5 lakhs by increasing the limits under existing provisions of Section 87A. As per present Section 87A an individual is entitled to tax rebate upto Rs. 2,500/- if his total income does not exceed Rs. 3.50 lakhs. This rebate is available only for the individual tax payer who is resident of India for income tax purpose. So at present you are entitled to avail rebate upto Rs. 2,500/- against your tax liability provided your total income does not exceed the threshold limit of Rs. 3.50 lakhs for the year. So anybody and everybody is not entitled to avail this rebate. Though the basic exemption limit of Rs. 2.50 lakhs is applicable for all Individuals and HUFs and generally various other provisions of the Income Tax Act like Deduction under Section 80C, 80D etc. apply to Individual and HUF both but the provisions of Section 87A are applicable to only individuals and not to HUFs. This provisions is also not applicable for all the Individuals but only for the individuals who are resident for income tax purpose which is determined on the basis of your stay in India during the previous year. 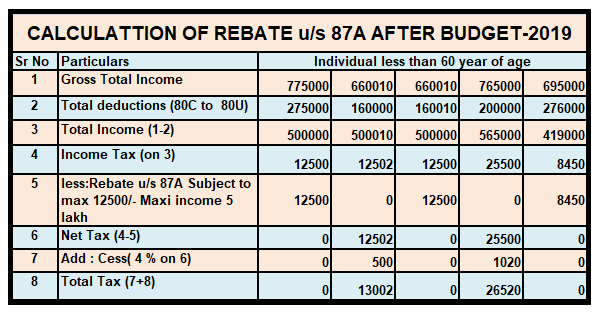 So in order to make income exempt upto 5 lakhs what the FM has proposed is that he has just increased the amount of rebate available as well as the eligibility criteria under Section 87A for this purpose. So as per the proposal, instead of a rebate upto Rs. 2,500/- available hitherto, the rebate will be available upto Rs. 12,500/-. Likewise now all resident Individuals whose income does not exceed Rs. 5 lakhs will be entitled to avail this expanded rebate instead of the present 3.50 lakhs presently. Once the income cross the magical number of five lakhs, the tax payer is burdened with a tax liability of 12,500/- even if the incremental income is only a few hundreds which is unjust to say the least and will induce tax payers to use ingenious means to bring it under 5 lakhs rupees. There are provisions of marginal relief for the tax payers whose income exceeds Rs. 50 lakhs and who are subjected to surcharge on the income tax for the entire amount. The provisions of marginal relief provides that in no circumstances the incremental tax shall exceed the amount of income which exceeds the threshold limit for surcharge. A similar provisions needs to be added to the existing provision of Section 87A. Since different definitions of income are provided in the income tax laws, there has always been confusion in the minds of taxpayers as to which income is relevant for this rebate. The tax rebate eligibility is to be determined with reference to the income which is considered for computing the amount of tax payable. Income for Section 87A means the net income which is arrived at after you have set off all your eligible brought forward old losses which you are entitled to set off against the income of current year. Moreover this net adjusted income from all the sources after set off of the losses has to be further reduced by amount of deduction available under various sections of Chapter VIA like Section 80C (For LIP, EPF, PPF, ELSS, tuition fee, home loan repayment etc. ), Section 80 CCD (NPS) under Section80 D (Health Insurance),80 G (donations) and 80 TTA and 80TTB (Bank interest) etc.. So in addition to the deduction for investments made and expenses incurred by you, you can also set off any loss brought forward from previous years against the current income. The rebate of Rs. 12,500/- available to you is virtually a tax credit in your hand which you can adjust against your tax liability. However it is not available against all of your tax liability. It can be adjusted against tax payable on your normal income at the slab rate. You can also adjust this rebate against tax payable for long term capital gains (LTCG) under Section 112 on sale of capital assets (Other than listed equity shares and equity oriented schemes of mutual funds) and any short term capital gains liability for listed equity shares and equity oriented schemes of mutual funds payable @ 15% under Section 111A. It is interesting to note that you can not adjust your tax liability for LTCG on listed equity shares and equity oriented schemes of mutual funds (which is charged @ 10% on the profits in excess of initial exemption of Rs. one lakh against this rebate. ).